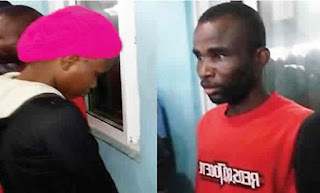 One Moses Otimba, a 47-year-old man from Ogbogoro community, Yenagoa, Bayelsa State , has been accused of impregnating his wife’s younger sister, Joy Matthew and killing the baby. He was said to have allowed her carry the baby for nine months ,before asphyxiating and burying the five-day-old beside the sea shore in Yenagoa. Otimba, the police said, took 18-year-old Joy to a traditional birth attendant where the baby was born, before he, along with the teenager collected the baby five days later, moved across the Swali bridge, killed him and buried him in a shallow grave. Two months later the young girl was said to have confessed to her mother who reported the incident to the police. The two suspects were paraded yesterday by the Commissioner of Police, Bayelsa State Command, Mr. Asuquo Amba, at the command’s headquarters in the state capital. ”Mr. Moses Otimba, male, 47, impregnated one Joy Matthew, 18, a younger sister to his wife, Glory. The pregnant Joy was delivered of the baby by a traditional birth attendant at Amarata, Yenagoa on May 8, 2017. Amba said Joy, who claimed to be under the influence of ”some spirits”, disclosed the incident to her mother some months after the act. He added that the police visited the scene of the incident , stressing that by the time they got to the scene, the currents of the river had washed off the child’s body. ”The suspect, Moses Otimba, has confessed to the crime and Joy Matthew has also confessed on her alleged involvement in the murder of the baby. Investigation is ongoing”, the police chief said. But Otimba in an interview admitted that he killed the baby boy because he was ashamed to face his wife (Glory) and his mother-in-law. He confessed that he killed the baby with the consent of Joy, after discussing his predicament with her. Otimba said: ”I killed the baby boy because I was afraid and scared. I did not really know how to face my wife and my mother-in-law. That was why I killed the baby. I am really sorry. Also paraded was one Isah Mohammed, 31, whom the police said was in the habit of killing vultures and selling them as chicken meet. Meanwhile, an 11-year old boy was yesterday electrocuted to death in Biogbolo community, Yenagoa, after he unknowingly picked up a power line that fell in the area. ‎The boy identified as Joseph was reported to have died immediately after grabbing the live cable. THISDAY learnt that the wire fell after the heavy downpour ‎last week. But residents of the area claimed they had alerted the Port Harcourt Electricity Distribution Company (PHED) but they failed to effect the repair. 0 Response to "Man Impregnates Wife’s Younger Sister, Kills Baby Days After Bath"